We’re learning a lot in this new place that we now call home. Nashville. Although we didn’t cook Turkey at home, we had our first thanksgiving meal, thanks to Sophia, who invited us for a meal over at their new home, which was 30 minutes away from ours. And when I say 30 minutes, that is by Nashville, not Manila, standards. If this were Manila, 30 minutes would just be enough time for me to travel about 3 kilometers. But here, a 30-minute drive is about 20 miles (roughly 48 km). We had Turkey, as expected. And in case you’re wondering, it tastes like chicken! But we also had grilled pork ribs, which were awesome! Plus some greens, and other goodies that are typical American fare. Sola (another friend of ours) cooked Biko, which reminded me of home, especially at this time of year, when those puto-bumbong sellers start to show up near the churches in the Philippines. The biggest surprise of Thanksgiving night, probably, was Coco’s friendliness with Sophia’s dogs Ollie & Jojo. He wasn’t afraid of them at all. 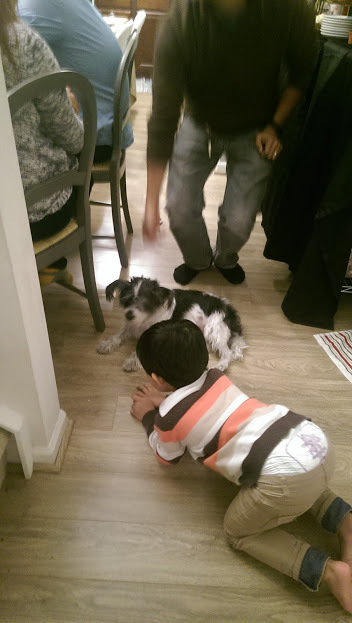 After getting acquainted with them, he ended up running, playing, and even kissing those adorable dogs! Coco was literally crawling on the floor just to play with the dogs. We went home with full stomachs and a reminder that there are friends, too, in this other side of the world. The day after Thanksgiving, called Black Friday, is considered as the biggest sale season in the United States. While we didn’t have plans on spending lots of money shopping, we wanted to watch Disney-Pixar’s The Good Dinosaur. I was expecting traffic to be bad. Like Manila kind of bad. I was even checking Google for patterns of traffic in Nashville for 2014. I was even considering not going out on Black Friday just to avoid the stress of going anywhere near a shopping mall. Maybe I was thinking of Manila traffic during the holidays. I was stressing about it so bad that Cha said I might be overthinking things. As it turned out, she was right. When we went to the Providence Shopping Center about 8 miles away from our place, it wasn’t bad at all. I even found a parking spot easily. Either Nashville shoppers are not so crazy about Black Friday. Or it has toned down this year. We watched The Good Dinosaur. It was about a young dinosaur coming of age and encountering a critter, who turned out to be a human child, being swept away, and journeying back home. The story revolved around a family living life together, and weathering storms–literally and figuratively. Although Coco is but 2.5 years old, he’s pretty tall for his age and he talks a lot now. So we ended up having some live toddler commentary insider the movie theater. “It’s dark,” he said when the lights were turned off. “Wow!” he exclaims whenever something cool happens on screen. And he would also imitate the howl of the critter/human child who was following Arlo around. At least, he was engrossed by the film he was watching. Kinda like the way he was when he watched Finding Nemo on the plane while we were on our way from Manila to Nashville. After the movie, we did went to some shops just to experience what this Black Friday was all about. It wasn’t much. At least for us. But we ended up picking up a heavy coat for Coco. For when the winter really hits us. And I picked up pair of boots that were on sale. I guess, if your family is a newcomer in the US, you cannot afford to splurge on clothes, tech, and other things. Maybe when we’re settled and there’s more disposable income, we could. But even then, we might not. All the same, it’s a good experience on Thanksgiving week.